It seems like yonks since I last posted a 10 Things. But that's maybe because January and February have been the busiest of months. In all honesty, I'm rather feeling like the things that have made me happy have been a bit few and far between at the moment. Because the things that have been keeping me so busy, aren't really full of joy.. In fact, some of them have been (and are) entirely crap. And maybe I'll share a little more of that on BTB because not being OK all the time is OK too. Anyway, there were some things among the rest of the.. hogwash, that did make me happy lately so let's share those. one. // the Food Wishes YouTube channel and Chef John. Found him whilst looking for a demi glace video and the rest is history! I love that his videos (I've gone back a couple of years worth now) haven't seemed to have changed, F hates his 'rollercoaster inflection' (which btw doesn't bother me in the slightest). two. // my Etienne bedspread from The White Company, some of the H&M home range and essentially anything from Zara Home. Frilly cushion covers, silver photo frames, this pretty floral candle, this pink blanket. I've had a little revamp of the bedside situation in the guest room and had so many compliments on it, so thank you! three. // FOOD. I think I'll start giving food it's own permanent spot here on 10 Things because there's never a time it won't be making me happy in some capacity. This time, it's demi glace (I've been having roasted parsnips and cavolo nero swimming in the stuff), homemade beurre blanc, my loose version of fresh pistou, wild salmon, and chestnut smoked salmon and wasabi. five. // concerning Netflix: Old episodes of Death in Paradise (Ben Miller only please), Bob Ross and his happy little paintings, and Salt Fat Acid Heat. six. // This Valentine's Day shoot. The weather was delightful and F and I had such a nice time of it. nine. 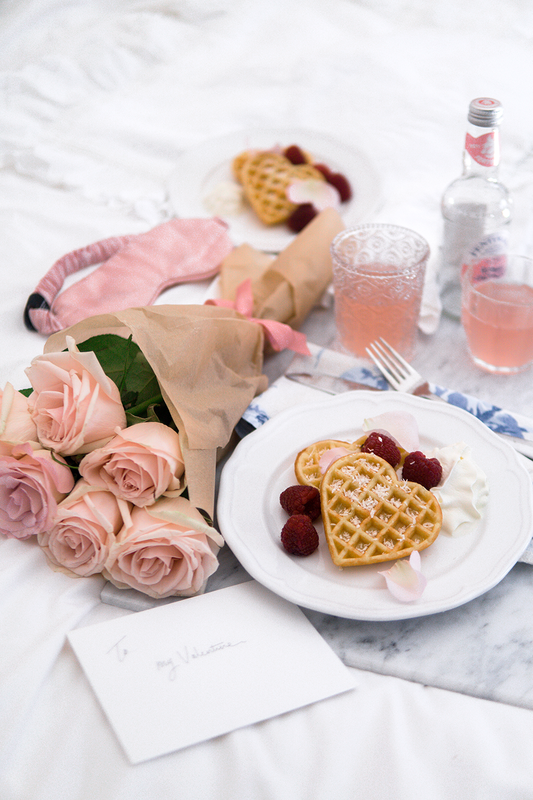 // breakfasts in bed. No more need be said I feel. Especially when it's waffles. Or crumpets. ten. // having hugs on tap when I feel needy of them. Can I come for waffles? This is such a lovely and positive blog post sweetie!